For the first time in over twenty years, the Brooklyn Museum presents a selection from The Life of Our Lord Jesus Christ, a set of 350 watercolors by the French painter James Tissot (1836–1902). 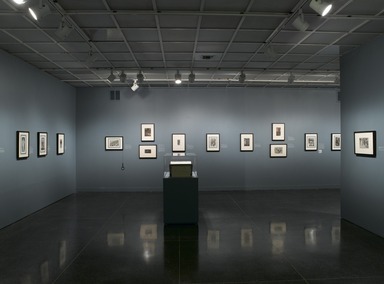 Purchased in 1900 by the citizens of Brooklyn for the Museum’s then three-year-old facility on Eastern Parkway, this set of watercolors, popularly known as The Life of Christ, remains one of the institution’s most important early acquisitions. Following a successful career painting London society, Tissot returned to Paris in 1882 to reestablish his reputation in his homeland, revisiting familiar fashionable terrain with a series of fifteen works called The Woman of Paris. While sketching for one of his subjects at the Church of Saint-Sulpice, however, he suddenly experienced a religious vision during the service: a bloodied but luminous Christ comforting the tattered poor in the rubble of a devastated building. After this transformative vision (feverishly recorded in an oil painting called Inward Voices, which he secreted away), Tissot rededicated himself to the Catholicism of his youth and embarked on a ten-year project to illustrate the New Testament. He traveled to Egypt, Syria, and Palestine in 1886–87 and 1889 to sketch the landscape, architecture, customs, and people of the region often called the Holy Land, which he imagined unchanged since the time of Jesus. 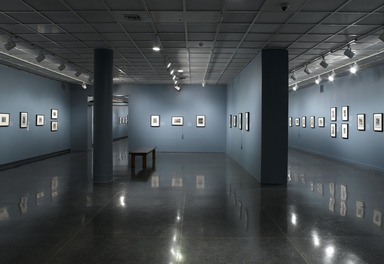 Characterizing his project as “pencil reporting from the life of Christ,” he described his process as a blend of rigorously objective observation and mystical revelation. When Tissot debuted 270 watercolors from The Life of Christ at the 1894 Salon in Paris, these visually stunning works were greeted with intense enthusiasm. According to contemporaneous accounts, women wept or kneeled before the watercolors, sometimes crawling from picture to picture, while men reverently removed their hats. Tissot published an abridged version of the New Testament illustrated with reproductions of his watercolors. These volumes featured the artist’s own written commentary on the Gospel accounts as well as his extensive notes on the biblical sites he had visited, giving his publication the tone of a travelogue as much as a learned treatise on a sacred text. 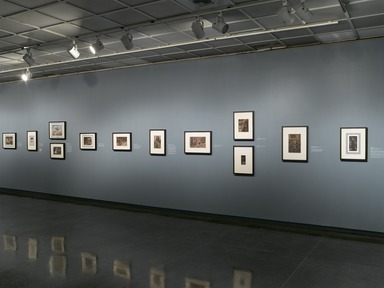 Through close study of Tissot’s watercolors and his published commentary, this exhibition demonstrates how his Life of Christ attempted to combine modern, empirical observation of the Holy Land with a respect for the intangible elements of religious belief. Tissot’s work draws a concern for archaeological detail into his embrace of the mystical. For the opening chapter of the Tissot Bible, the artist painted the youth of Jesus, tracing the child’s journey from the revelation to the Virgin Mary that she would conceive a son to his apprenticeship in his father Joseph’s carpentry shop. In Tissot’s depictions of these childhood scenes, the members of the Holy Family submit humbly to their roles in the divine drama, despite its mysteries and dangers. The New Testament’s near silence on the youth of Jesus has long encouraged creative license among artists and writers alike, and Tissot was no exception. These early episodes range in locale from the Temple in Jerusalem to the deserts and cities of Egypt. 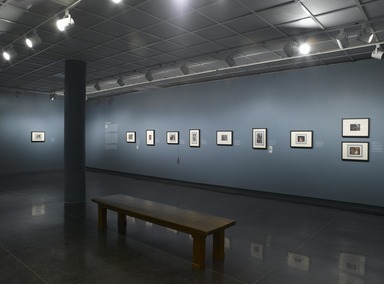 The painter invested these scenes with a wealth of visual detail in order to imbue the series with what he called “the stamp of truth,” basing his renderings of the landscape, costumes, architecture, and people on what he had observed and extensively sketched and photographed during his travels in Egypt, Syria, and Palestine. While keenly interested in establishing the veracity of the settings, Tissot also introduced a number of imaginative interpretations of both the mundane and the otherworldly events in the narrative, signature touches that put his own mark on the story. Tissot depicted the adult Jesus as a revolutionary reformer seeking to transform societal and religious conventions. Throughout, Jesus displays an unaffected humility, clad simply in a robe of white, a costume that the artist saw as symbolic of spiritual purity. Moreover, these pristine robes help viewers to identify Jesus in the crowded scenes of preaching and processions. Despite his concern with presenting an informed and accurate image of the Jesus of history, Tissot remained equally committed to the Jesus of faith, a dedication he pursued through fantastic visualizations of miraculous moments described in the Bible. Eager to portray the many miracles Jesus performed during his ministry, Tissot ultimately illustrated thirty-five of them, including healings, resurrections, exorcisms, and material transformations—acts designed to dramatize his mission of reform and inspire faith. Also portrayed were key episodes of Jesus’ preaching, such as the Sermon on the Mount and the recitation of the Lord’s Prayer. The artist depicted as well the parables, or fables, that Jesus told to his followers to illustrate his moral teachings. Tissot found the scenes of Christ’s Passion—his sufferings and Crucifixion—more absorbing than any of the others he had composed throughout The Life of Christ. Most of these images ask the viewer to consider the brutal mechanics of the Passion and, thereby, to meditate on precisely what Christ endured to secure redemption for humanity. With such vivid details, the artist demands that the viewer confront the specific instruments of execution and how they were manipulated in the Roman world. True to his mission, he wished to capture the audience’s imagination in such a way that the events of two thousand years ago would seem as immediate as those of his own day. For Tissot, Holy Week serves as the immediate prelude to the grand drama of the Passion. After the section called the Ministry, which traced Jesus’ travels and teachings around Israel, his last days focus on the Temple precinct in Jerusalem, where he comes into direct confrontation with his opponents. A succinct turning point in the narrative, the section Tissot called Holy Week does not actually cover the full week’s time designated in the church calendar. Instead the artist decided to encompass under that heading only the four days from Palm Sunday to Wednesday—from Jesus’ triumphant entry into Jerusalem to his tragic betrayal by Judas Iscariot. Tissot then devoted a new, climactic section to the Passion, recounting there the dramatic events of Holy Thursday and Good Friday. This final section of Tissot’s narrative encompasses the period of time from the immediate aftermath of the Crucifixion to Jesus’ Resurrection from the dead and his subsequent ascent into heaven. Tissot matches highly detailed scenes of burial preparations with the mystical wonder of Christ’s appearances after the Resurrection, presenting the historical and divine aspects of Jesus in equal measure. The artist pays particular attention to the drama’s survivors, the friends and family of Jesus. First among them is the Virgin Mary, who assumes the primary responsibility for her son’s funerary rites. And after the Resurrection, Jesus appears to Mary Magdalene and his disciples, his wounds glowing as testimony to his earthly sufferings. Tissot closes his series and his publication with an unusual self-portrait in which he presents himself surrounded by funerary symbols. For the devoted readers of Tissot’s Bible, this valedictory image would end each viewing, recalling the artist who created the work and asking that he be remembered in their prayers. When Tissot traveled through the Holy Land in the 1880s on his various research trips for The Life of Christ, he made elaborate pen-and-ink sketches of the landscape and people he encountered. 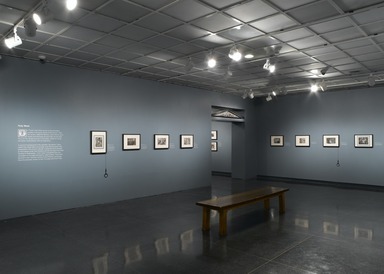 Over one hundred individual drawings of this kind entered the Museum’s collection in 1900 along with the series of 350 watercolors. 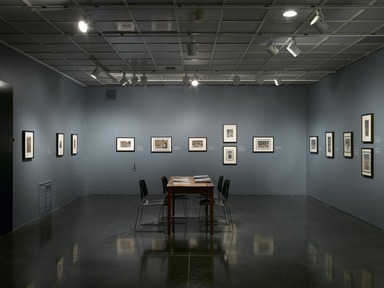 In 1992, the Museum acquired a sketchbook of studies executed in graphite and wash, which is displayed nearby. 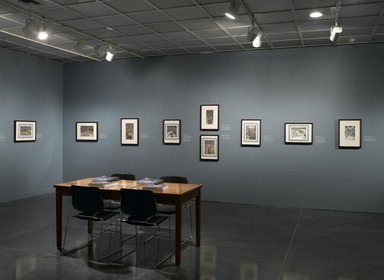 The sketchbook can also be viewed in digital form at the adjacent kiosk and on the Museum’s Web site. Interviews given to magazines in the late 1890s suggest that Tissot labored during the evening hours in the quiet of his lodgings in Jerusalem to compose scenes for the series. First working from sketches and notes the size of “postage stamps” (examples of these can be seen in the first several pages of the sketchbook), he would, as one writer described in an 1899 article, “enlarge one of these into a more detailed sketch, outlining the background and central figures in heavy black lines; the whole, still formless with only black ovals for the heads and a few rough lines for the bodies.” For reasons that remain unexplained, he highlighted some drawings with a reddish wash.
Tissot used this sketchbook to make preparatory compositional sketches and notations for a number of watercolors in this exhibition depicting the Passion and the Resurrection. Two such examples are illustrated here. Others can be found in the digitized version of the sketchbook. Tissot’s trips to the Middle East demonstrate his commitment to creating a veristic portrayal of the Holy Land in the time of Christ, as the reconstructions shown here demonstrate. In this he was not unique. Several prominent nineteenth-century European painters, including Horace Vernet (1789–1863), David Roberts (1796–1864), and William Holman Hunt (1827–1910), had ventured to the Middle East to document the sites of the biblical narratives. Later, with the advent of the camera, photographers such as Maxime du Camp (1822–1894) and Francis Frith (1822–1898) also traveled to the Middle East to capture these locales with this new and evolving technology. Tissot himself reportedly took photographs during his explorations; unfortunately, their whereabouts (if they exist) remain unknown. Many of these efforts sought to create an eyewitness account that would confirm the biblical texts, in the face of challenges to religious faith in the scientific age. 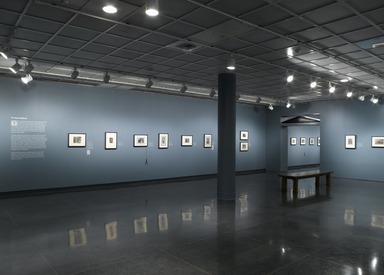 After Tissot completed The Life of Christ, in 1896, he showed the series of watercolors in London and then arranged for a two-year paid-entry tour of major cities in the United States, including, among others, New York, Brooklyn, Philadelphia, Boston, and Chicago, in 1898–1900. 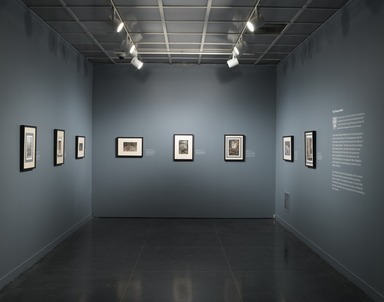 In 1900, the Board of Trustees of the Brooklyn Institute of Arts and Sciences, now the Brooklyn Museum, resolved to purchase the entirety of Tissot’s watercolor series, along with its accompanying pen-and-ink sketches. A. Augustus Healy, president of the Board, was urged to make this acquisition by his friend the painter John Singer Sargent. Buoyed by the success of the North American tour of the works, Healy traveled to France to meet with Tissot. They negotiated a purchase price of $60,000, a very substantial sum for any work of art at that time. Obtaining these works was intended to fulfill several goals of the Institute and the borough at large. The purchase of the 350 watercolors would provide the Institute with a core body of works, increasing the size of its fledgling permanent collection several times over. 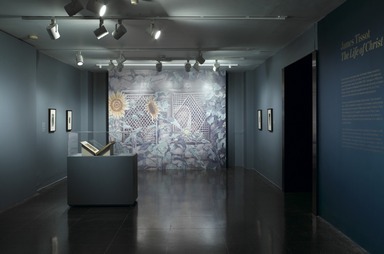 Already demonstrated to be immensely popular in their European and American tours, these works were expected to lure paying visitors to the Institute, securing its success and establishing an important cultural attraction for Brooklyn. Finally, The Life of Christ was deemed a worthy educational narrative for the museumgoing public. 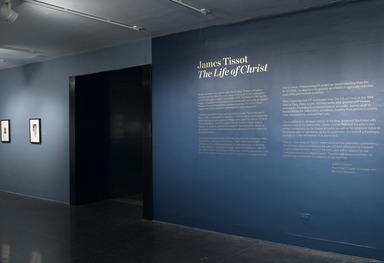 May 4, 2009 The exhibition James Tissot: “The Life of Christ” will include 124 watercolors selected from a set of 350 that depict detailed scenes from the New Testament, from before the birth of Jesus through the Resurrection, in a chronological narrative. 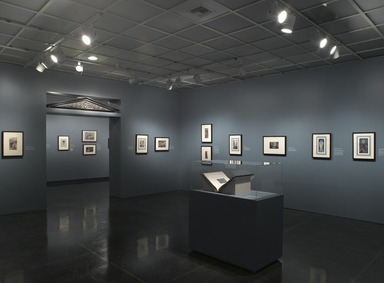 On view from October 23, 2009, through January 17, 2010, it marks the first time in more than twenty years that any of the Tissot watercolors, a pivotal acquisition that entered the collection in 1900, have been on view at the Brooklyn Museum. The exhibition has been organized by Judith F. Dolkart, Associate Curator, European Art, and will travel to venues to be announced. It will be accompanied by a fully illustrated catalogue of the complete set of 350 images, to be published by the Museum in association with Merrell Publishers Ltd, London. Born in France, James Tissot (1836-1902) had a successful artistic career in Paris before going to London in the 1870s, where he established himself as a renowned painter of London society, spending eleven years there before returning to Paris in 1882. He then began work on a set of fifteen paintings depicting the costumes and manners of fashionable Parisian society women. While visiting the Church of St. Sulpice in the course of his research, he experienced a religious vision, after which he embarked on an ambitious project to illustrate the New Testament. With the same meticulous attention to detail that he had applied to painting high society, he now created these precisely rendered watercolors. In preparation, he made expeditions to the Middle East to record the landscape, architecture, costumes, and customs of the Holy Land and its people, which he recorded in photographs, notes, and sketches, convinced that the region had remained unchanged since Jesus’s time. When he returned to his Paris studio he drew upon his research materials to execute the watercolors, concentrating on this project to the exclusion of his previous subject matter. Unlike earlier artists, who often depicted biblical figures anachronistically, Tissot painted the many figures in costumes he believed to be historically authentic. In addition to the archaeological exactitude of many of the watercolors, the series presents other, highly dramatic and often mystical images, such as Jesus Ministered to by Angels and The Grotto of the Agony. Tissot’s detailed chronological approach to recounting the life of Christ, combining Matthew, Mark, Luke, and John into one continuous narrative, is known as a “harmony” of the Gospels, a departure from the traditional reading that takes each of the separate books in turn. 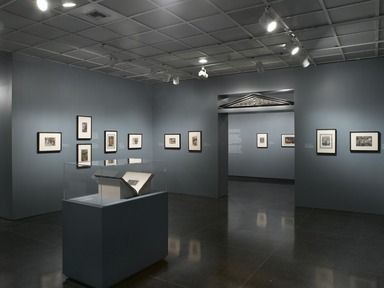 The exhibition includes a wide range of works from the series, from sweeping historical scenes such as Reconstruction of Jerusalem and the Temple of Herod and Reconstruction of Golgotha and the Holy Sepulchre Seen from the Walls of Herod’s Palace to a remarkable tableau of Golgotha as seen from the vantage point of Jesus himself, entitled What Our Lord Saw from the Cross. Many of the images are small, some measuring little more than 6 by 4 inches; the largest are slightly more than 8 by 17 inches. Several of the works, such as The Miracle of the Loaves and Fishes, The Procession in the Streets of Jerusalem, and Jerusalem, Jerusalem, include large crowds of people, all the more notable because of the detail packed into images of such small scale. Others depict a single, strong figure such as Herod, Jesus shown at various stages of his life, and Mary Magdalene, whose features were modeled after Tissot’s deceased mistress, Mrs. Kathleen Newton. 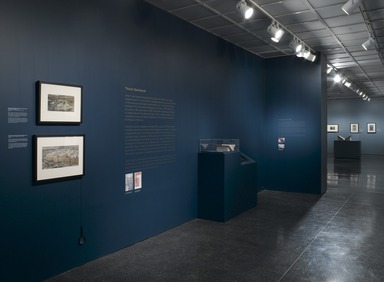 Also on view in the exhibition is a small sketchbook containing pencil and wash drawings done during a trip to Jerusalem. Tissot began the monumental task of illustrating the New Testament in 1886 and first presented selections at the Paris Salon in 1894 (before the series’ completion), where they were received with great enthusiasm. Press accounts on both sides of the Atlantic reported emotional reactions among the visitors: some women wept or kneeled before the works, crawling from picture to picture, while men removed their hats in reverence. 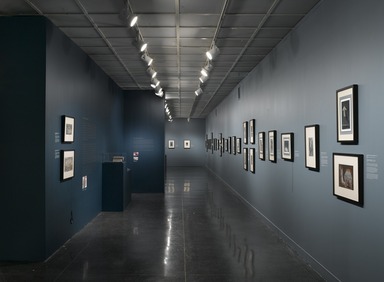 Following the completion of the series in 1896, Tissot arranged paid-entry showings in London and in the United States; a successful multi-city tour visited Manhattan, Brooklyn, Boston, Philadelphia, and Chicago. In 1900, at the suggestion of John Singer Sargent, the President and Trustees of the Museum’s precursor, the Brooklyn Institute of Arts and Sciences, decided to purchase the series at the negotiated price of $60,000. Part of the sum was raised through a pledge of $13,000 from the Trustees but the bulk by public subscription, spurred on, in part, by exhortations published in the Brooklyn Daily Eagle newspaper urging its readers to contribute. 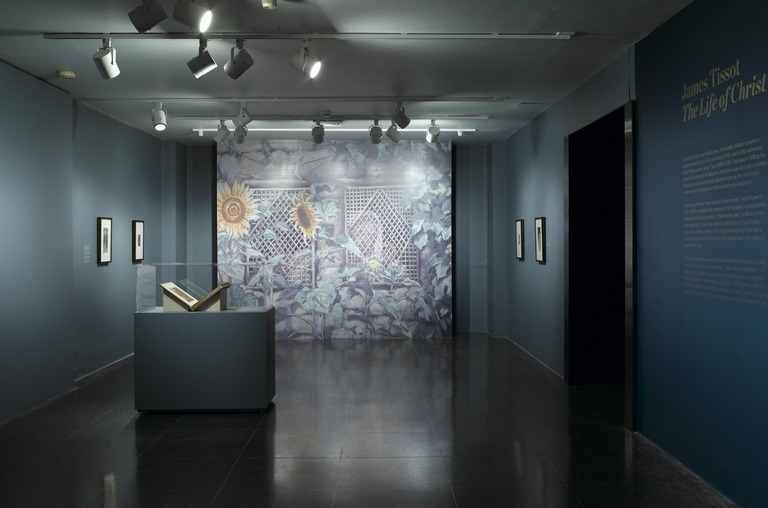 The purchase was a significant acquisition for the Institute; the sheer number of watercolors increased by several times the art collection of the fledgling museum and was viewed as having great potential to attract visitors and new members. 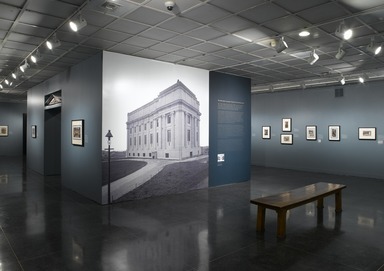 Because the Museum’s landmark building on Eastern Parkway was still in the process of being constructed, with only the West Wing open, the Tissot watercolors were first shown in a Montague Street gallery; the walls were adorned with flowers and palms, and a boy soprano sang devotional music. 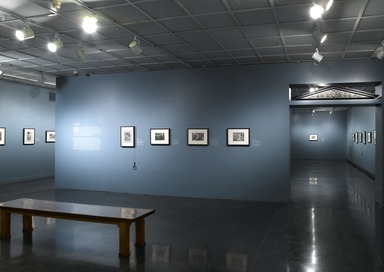 For a sixteen-day period, the Institute extended its exhibition hours from 9 a.m. until 10 p.m. 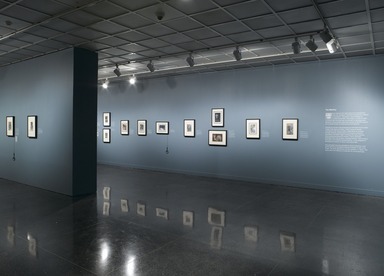 In May 1901 the 350 watercolors, newly mounted in gold mats and reframed, went on view for the first time on Eastern Parkway; records seem to indicate they remained on nearly continuous display until the 1930s. Since then, in part because of conservation concerns, they have only rarely been shown, and then only small portions of the series, most recently in late 1989 through early 1990.